The Star Trek franchise is currently in a period of uncertainty, as no one seems to know what's happening with the franchise. While there will most certainly be a new Star Trek movie coming in the near future, no one is sure what that will be, with Zachary Quinto revealing in a new interview that there are actually three separate Star Trek 4 scripts being worked on as we speak. 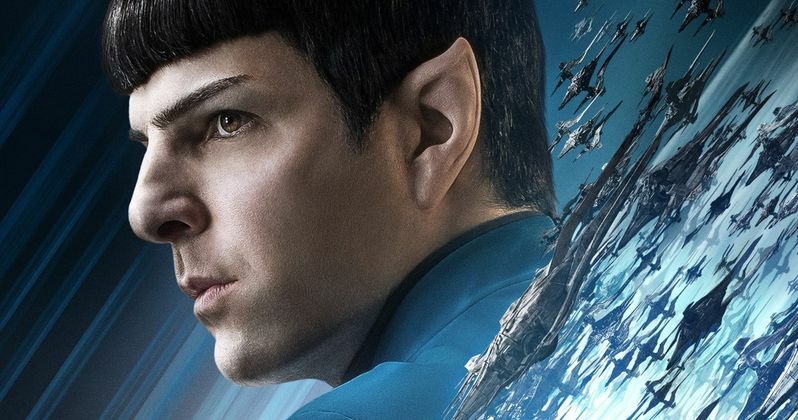 Here's what Zachary Quinto had to say about the upcoming sequel, stating that everyone is in a "state of anticipation" for the movie. "First of all, I think there's a couple of scripts. Because there was a script being written before Quentin Tarantino came up with his idea for a potential film. And so I think they are kind of developing more than one. So I don't know what is going to happen. Quentin is off doing another movie. So, I feel like we are in a state of anticipation. All of us are really excited about the idea of working with Quentin on a Trek film, but I know Simon Pegg and Doug Jung, who wrote the last film, are writing a script and there are another set of writers writing a script. So I don't know. I don't know what's going to happen." Simon Pegg revealed last week that the script he was working on for Star Trek 4 with Doug Jung was completed before Quentin Tarantino's pitch surfaced, which he is working on with J.J. Abrams. There is still no indication if the current Star Trek cast, including Chris Pine, Zachary Quinto, Zoe Saldana, Simon Pegg, John Cho and Karl Urban, will be used for Tarantino's Star Trek. Quentin Tarantino is currently in pre-production on his new film Once Upon a Time in Hollywood, which will start filming sometime this summer, with Sony setting an August 9, 2019 release date, which is the 50th Anniversary of the Manson Family murder of Sharon Tate. The original incarnation of Star Trek 4 was revealed back in July 2016, when it was confirmed that Chris Hemsworth will reprise his role from the 2009 Star Trek movie as George Kirk, the father of Chris Pine's James Tiberius Kirk. Despite dying in the opening moments of that movie, as his son was born, it was revealed that James Kirk will somehow get to meet his father in Star Trek 4, which will likely involve some sort of time travel element. That original report also revealed that J.D. Payne and Patrick McKay, who were uncredited writers on Star Trek Beyond, are writing the script, so it seems likely they are the third team of writers mentioned by Zachary Quinto. J.J. Abrams is expected to produce through his Bad Robot Productions company, although there is no indication when production will take place. If Paramount does decide to go with Tarantino's film, that likely won't start production until late next year, at the earliest, after his Once Upon a Time in Hollywood is completed and released. It's possible that Paramount could move forward with one of the other scripts before Tarantino is ready to make his Star Trek movie, but the studio has not revealed their plans at this time. Take a look at Zachary Quinto's interview below, courtesy of Entertainment Tonight Canada.